The following was excerpted from The Wall Street Journal’s weekend edition 10/4-5/2014. I found it fascinating, and the most salient points are bolded (by me). I found it extremely interesting and hope you do too! George Clooney’s four-day wedding extravaganza might have cost somewhere in the region of $13 million. But if it leaves mere mortals feeling even more pressure to spend lavishly for their own “one perfect day,” they might want to pause first. New research has found no positive correlation at all between having a big, expensive wedding and a successful marriage. Quite the reverse. “We find evidence that marriage duration is inversely associated with spending on the engagement ring and wedding ceremony,” write Andrew Francis and Hugo Mialon, two economics professors at Emory University in Atlanta, in a paper published last month titled “‘A Diamond Is Forever’ and Other Fairy Tales: The Relationship between Wedding Expenses and Marriage Duration.” The study was based on the wedding budgets and marriage track records of more than 3,000 U.S. adults. The authors found that women whose weddings had cost more than $20,000 (in 2014 dollars) ended up getting divorced 60% more often than those whose weddings were cheaper. And men who spent between $2,000 and $4,000 on their engagement ring got divorced 30% more often than those who spent between $500 and $2,000. How much weight should we place on this? It is only one study. Messrs. Francis and Mialon themselves say the topic merits further research. And even if more expensive weddings are correlated with more divorces, that doesn’t mean they cause them. “There’s a difference between correlation and causation,” says Anja Winikka, the site director at The Knot, a wedding industry magazine and website. For example, expensive weddings may simply attract the kind of immature and narcissistic people who are less likely to sustain a successful marriage. Such people might end up getting divorced even if they married cheaply. But there may be causation as well. An expensive wedding might in some cases be harmful. Many financial experts warn that the cost of an expensive wedding can put a strain on a couple. 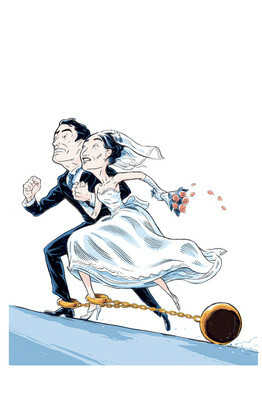 Financial planners note that money troubles consistently feature as a leading cause of marriage problems. According to The Knot’s most recent annual survey, the average U.S. wedding last year cost $29,858, or about 60% of the median household’s income—up 11% since 2010. During the same time, reports the U.S. Labor Department, hourly wages have risen a princely 2%. Mega-weddings are becoming more common too. Last year, says The Knot, one wedding in 10 cost between $50,000 and $100,000. That number has jumped sharply in recent years. The bride’s checklist has risen from 22 items to an extravagant multiple, depending on whom you ask. Supposed traditions such as the expensive white dress and the diamond engagement ring have been invented quite recently by their respective industries. In a desperate bid to control costs, brides and grooms these days are starting to trim the number of guests, say experts. The Knot, for its part, reports that the average number of guests has declined in recent years to an average of 138. The paradox: The Emory research suggests that instead of spending more money but having fewer guests, we should be doing the opposite. “The evidence suggests that the types of weddings associated with the lower likelihood of divorce are those that are relatively inexpensive but high in attendance,” write Messrs. Francis and Mialon.